Starlite is a material similar to plastic that can withstand high temperatures without flinching. It is no longer that it does not melt, but once it is removed from contact with these high temperatures, its touch is cold. A really interesting material and it is surprising that large engineering companies do not use it to create their technological advances. He worked as a hairdresser in the 1960s, taking pride in his work. Once he said in an interview, he liked to invent things in his free time. His hobby led him to buy an ICI extruder in the early 1980s. It was this purchase that led to what is considered his greatest achievement: the invention of the Starlite thermal shielding material. This is inspired by the Manchester plane crash of 1985. During which 55 people on board died in 40 seconds due to the inhalation of toxic fumes. He invented the material after ICI asked for a Citroen cap material. The material that Ward produced was a failure, being granulated and forgotten, until the accident occurred, with which Ward was inspired. "I was interested because it was an air disaster on land, and because it was the smoke and toxicity that killed people, not fire, fifty people died in 40 seconds, we thought we would find something that did not burn so much, that would be Useful”. 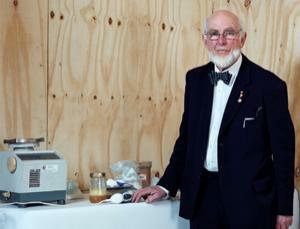 He began to mix different formulas of non-toxic and heat-resistant plastics, to which he refers casually as "gubbins". It was very productive, mixing up to 20 daily formulas. Finally, he produced a formula that looked promising, and he used the extruder he had bought years before to make it into sheets. He put it to the test with a blowtorch, dissipating the heat perfectly. This material became known as Starlite. Why this material has fallen almost into oblivion? Why has it never been commercialized? Starlite is a plastic-like material capable of withstanding and isolating extreme heat temperatures. "The name chosen for the material is due to cartoons of the time that were the favorite of Ward's granddaughter". During the 70s and 80s the starlite received much publicity and even in 1993, thanks to a program of the BBC, many engineering companies echoed their invention and tried to reach a commercial agreement to produce the material. In the tests carried out with starlite it was possible to verify how it was capable of withstanding attacks with a laser that emitted a beam of up to 10,000 ºC of temperature. 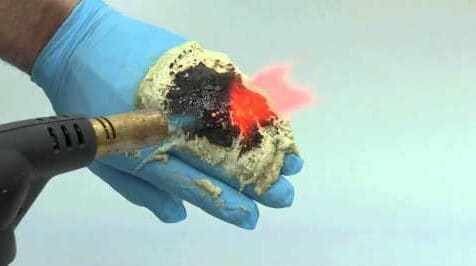 The surprising thing is not only that it did not melt, but that once it moves away from the focus of extreme heat, the material could be touched and its touch turned cold. 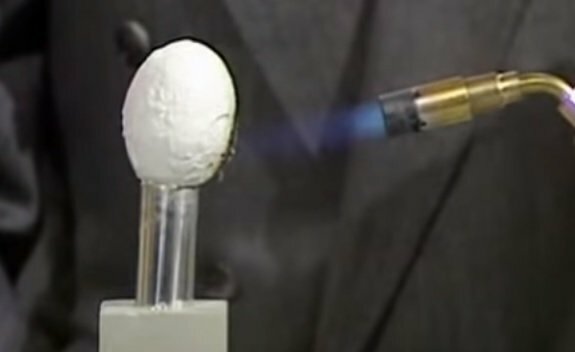 In the television program of the BBC, Tomorrow's World, was also demonstrated how the material kept an egg coated with cold starlite, even applying heat with a torch for about five minutes or as interposing the material between a heat source and a hand human, it was not damaged. Although at first, skepticism was present, the scientific community would end up recognizing that this material was real and very important, such was the case that for years NASA would try to reach an agreement with Maurice, but due to the commercial demands of the inventor, it came to nothing since it asked for 51% of the gross profit that generated the commercialization of its invention, this was the main obstacle so that this material did not have the prominence that perhaps it deserves due to its properties. After his death, the formula to create this kind of plastic was believed to have disappeared, but the scientific magazine New Scientists has recovered an old interview with Ward where he admitted to sharing his secret with a relative. The efforts of the big engineering companies were to find that Ward family assumption that preserves the formula for the manufacture of the material and try to reach a more reasonable commercial agreement for its production and use within modern engineering. It is hard to imagine that someone has the formula of this invention and do not try to reach an agreement with large companies like NASA, one of the most interested in making this rare material, because in any case, we are sure we are talking about millions of dollars. It is believed that the composition of starlite contains a wide variety of biopolymers and copolymers mixed with organic and inorganic additives, small amounts of ceramics and other unknown ingredients that remain a mystery today. If you had the secret formula, would you reach a commercial agreement that is probably multi-million dollar or would you prefer to take the secret to the grave as the Maurice Ward? You got a 1.57% upvote from @moneymatchgaming courtesy of @ancruz! Please consider upvoting this post to help support the MMG Competitive Gaming Community. You got a 14.29% upvote from @cabbage-dealer courtesy of @ancruz! This post has received a 2.62% upvote from thanks to: @ancruz!! !